WHILE EATING BREAKFAST at downtown Silver City’s Tre Rosat Cafe, I overheard a couple chatting at a nearby table. “Twenty years ago they were calling this town the next Santa Fe,” said a woman who looked to be in her mid-fifties. “It never happened.” Her husband nodded in agreement. “Too far from the interstate,” he added. Amen, I thought to myself. Don’t get me wrong—I love my former home city of Santa Fe. But one thing that makes New Mexico special is the diversity and singularity of its communities. From Albuquerque to Zuni, no town is quite like any other. Silver City was founded 150 years ago, on the heels of a silver-mining boom. Many who live in this sunny hilltop town of about 100,000 on the fringes of the Gila Wilderness still work in the mining industry, but Silver City and surrounding Grant County also claim a sizable number of artists, entrepreneurs, retirees, educators, students, and outdoorsy individualists who love it here precisely because it’s unlike any other place in the Southwest—or the world, for that matter. I fell hard for Silver City the first time I visited, about 15 years ago. 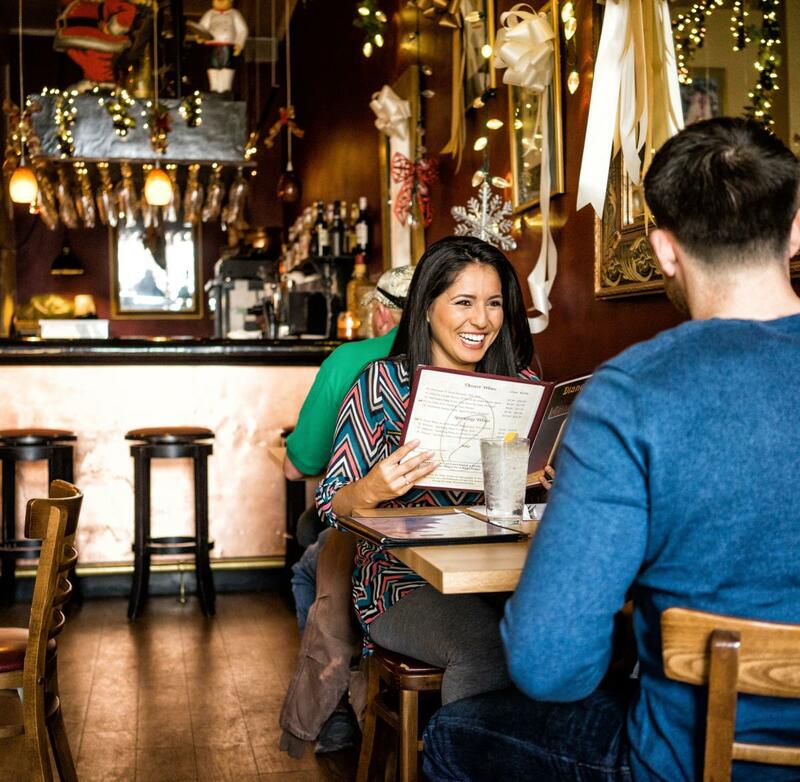 Entranced by the slowgoing drive through the Black Range along breathtakingly circuitous N.M. 152, I quickly delighted in the remarkable variety of one-of-a-kind restaurants and funky boutiques along downtown’s colorful commercial drag, Bullard Street. 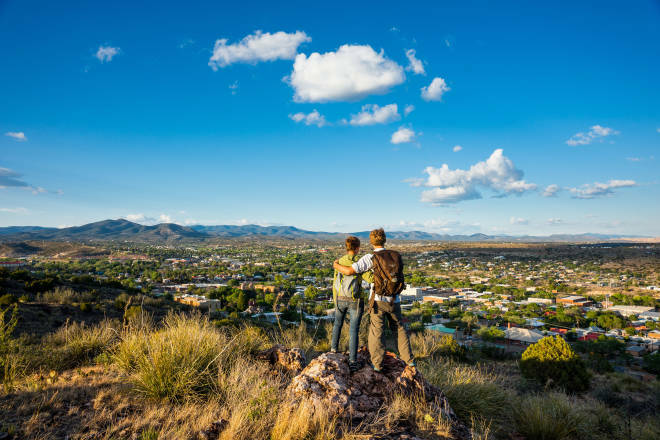 Adjacent to a minimally inhabited national forest nearly the size of Connecticut, Silver City might just be New Mexico’s ultimate destination for getting away from it all without actually having to forgo exceptional dining, distinctive accommodations, and top-notch arts and cultural attractions. My hope is that predictions about Silver City’s imminent transformation into the next this or that prove forever incorrect. 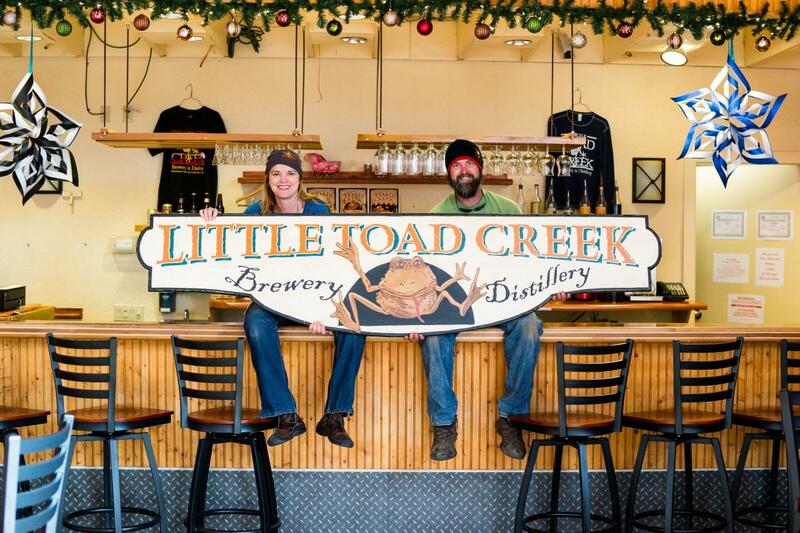 Here are 25 attributes of Silver City that make it such a charmed place to live and visit. Every road into Silver City is a stunner; two of New Mexico’s national scenic byways pass through the region. From the northeast, hop onto the 50-mile southern leg of the Geronimo Trail National Scenic Byway (geronimotrail.com), which begins in Caballo and follows N.M. 152 up through Hillsboro and Kingston before switchbacking through the Black Range over 8,228-foot Emory Pass. The Trail of the Mountain Spirits National Scenic Byway (tmsbyway.com) runs north along N.M. 15 from Silver City, passing through Pinos Altos, over the Continental Divide, along a ridge that leads across sweeping White Horse Mesa, and to Gila Cliff Dwellings National Monument. It’s just a 45-mile drive, but allow 90 minutes. The byway then backtracks to N.M. 35 near Lake Roberts, cutting southeast through the picturesque and secluded Mimbres Valley down to San Lorenzo, where it intersects with the western terminus of the Geronimo Trail byway. Just outside the city, the massive Gila Wilderness beckons hikers of all abilities with dozens of spectacular excursions, from rambles through coniferous forests to treks high up above the tree line. Nab a full list of popular day hikes at the Gila National Forest ranger office in Silver City (575-388-8201; mynm.us/gilahikes). If you have time for just one good trek, make it the Signal Peak hike (Trail No. 742). Just 14 miles north of Silver City, the five-mile round-trip ramble leads to one of the highest points in the Pinos Altos Range. At the top, you’re treated to 360-degree views from the Signal Peak Fire Lookout. Pictured at left: A view from the Boston Hill trail network. The region’s Mimbres-Mogollon people first started mining copper and turquoise around AD 20. Grant County’s mines have produced more copper, gold, silver, lead, and zinc than all the rest of New Mexico combined. Once the largest open-pit mine in the world, Chino (aka Santa Rita) Mine is about 15 miles east of town. Although you can’t enter this active copper mine, you can pull into the Santa Rita Overlook viewing area, off N.M. 152, which contains interpretive signs about the region’s rich copper deposits. Above: Diners at Diane&apos;s Restaurant. Silver City is home to some incredibly accomplished chefs, including Rob Connoley of the Curious Kumquat, a 2014 James Beard Award semifinalist for best chef in the Southwest. Check the dinner menu online before deciding whether to bring children—lunch is a safer option—and call ahead to ensure the restaurant is open as advertised on its website (575-534-0337; curiouskumquat.com). Just down the street, the staff at Shevek & Co. guides guests through an ambitious slow-food-driven menu that features grilled duck breast with a lively North African cranberry-and-preserved-lemon chutney, and baked scallops à la Galicia (575-534-9168; silver-eats.com). Open for dinner Friday through Sunday, 1zero6 offers a small, oft-changing dinner menu of innovative Latin American and Asian specialties that might include lemongrass shrimp with saffron rice and a fragrant mango sambal or Yucatán-style salmon pibil folded in banana leaf, served with a camote corn cake (575-313-4418; 1zero6-jake.blogspot.com). Across the street at Diane’s, order “Mama’s Meatloaf,” slow-baked and smothered in Diane’s rich tomato sauce. The weekend champagne brunch is a Silver City tradition, and there’s live music most nights in Diane’s parlor (575-538-8722; dianesrestaurant.com). The eerily beautiful Fort Bayard, with its quiet lanes of courtly vacant buildings, is one of the state’s most alluring and unusual spots. The 700-acre district, designated a national historic landmark in 2004, dates to the close of the Civil War, when the U.S. military established a garrison to protect the area’s settlers from Apache raiders. Troops here included hundreds of elite Buffalo Soldiers, among the nation’s earliest African American enlistees. Although the dozens of historic buildings—from modest white-clapboard bungalows to the three-story Territorial-style former hospital—are no longer in use, visitors can freely explore the grounds and admire the exteriors, and also take a poignant walk through Fort Bayard National Cemetery. 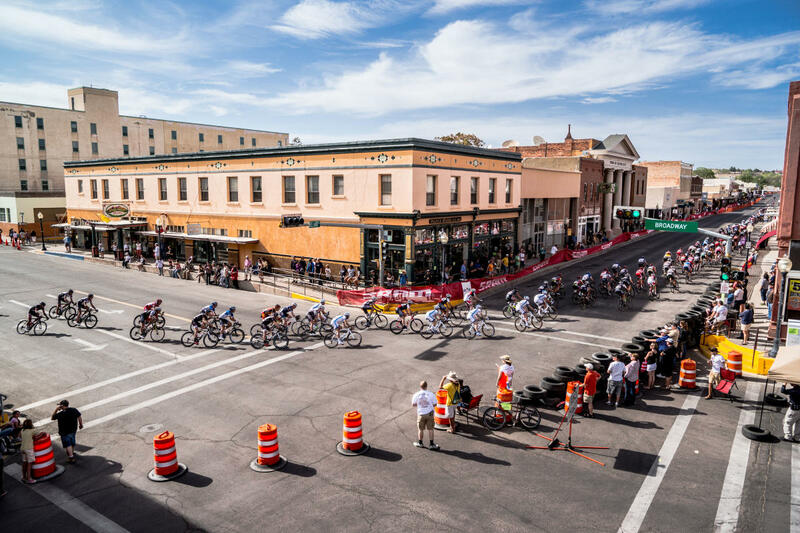 Above: Bikes trek through Silver City&apos;s main drag for the Tour of the Gila. Above: Gila Cliff Dwellings National Monument. 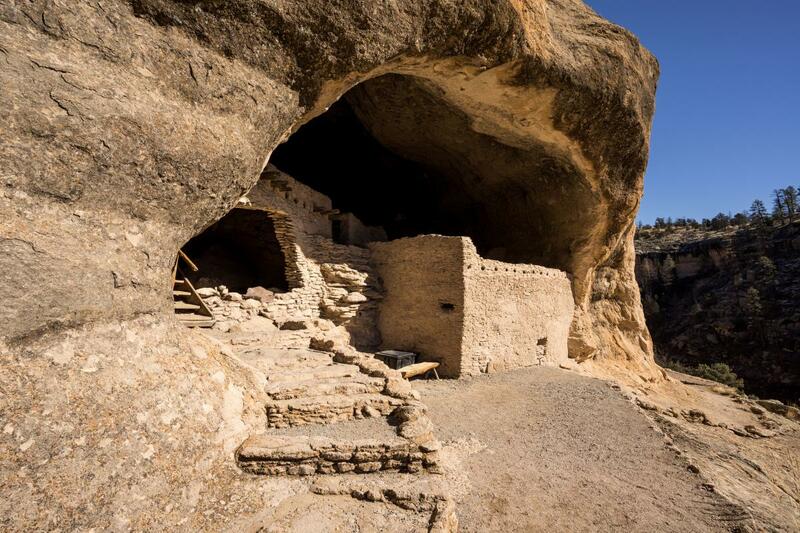 President Teddy Roosevelt designated the well-preserved cave dwellings 45 miles north of Silver City one of the first of the country’s national monuments, in 1907. Thank him for his foresight as you explore the five caves, occupied by Mogollon people in the late 13th century, which form the centerpiece of 533-acre Gila Cliff Dwellings National Monument. On the same downtown block, you’ll find two of the state’s most distinctive old hotels. The colorful Palace Hotel dates to 1900 and contains 18 comfortable rooms furnished simply with country quilts, antiques, and four-poster beds, as well as the updated room #62 (575-388-1811; silvercity-palacehotel.com). Reopened after an ambitious renovation in 2013, the striking art deco Murray Hotel was built in 1938—at five stories, it was then and remains today the tallest building in town. Expect plush beds with leather headboards and high-end bath amenities (575-956-9400; murray-hotel.com). Best of all, rates at both hotels are lower than or comparable to the several chain properties on the outskirts of downtown. You might not expect to find it in the remote Gila hinterlands, but in tiny and rugged nearby Pinos Altos, the carefully restored, 155-year-old Buckhorn Saloon & Opera House entertains guests with folk and Americana concerts and occasional Wild West–style melodrama; its restaurant serves first-rate steaks and burgers (575-538-9911; buckhornsaloonandoperahouse.com). About 200 folks make their home in this former gold-rush town. 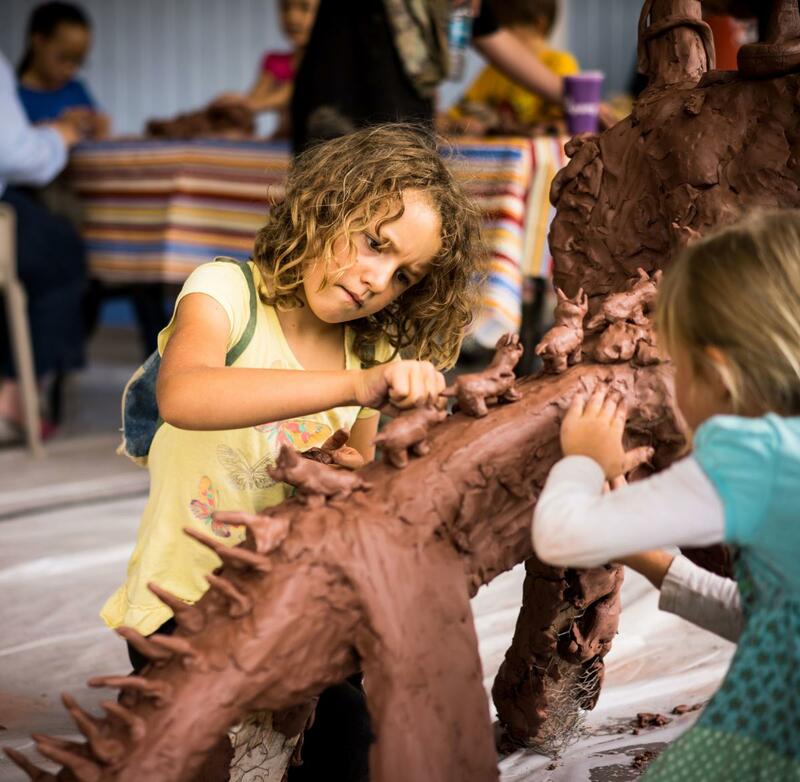 Above: Children play at the Silver City CLAY Festival. Soak up the local creative spirit along the two gallery-packed blocks of Yankie Street between Bullard and Arizona Streets. Highlights include the vibrant-hued wool tapestries of Donna Foley, who raises sheep to produce her own wool, at Four Directions Weaving (fourdirectionsweaving.com; 575-263-3830), and the contemporary landscape paintings and photography on display at Wynnegate Galleries (wynnegategalleries.com; 214-957-3688). Stop by Seedboat Gallery (seedboatgallery.com; 575-534-1136), a handsome adobe complex where you can view the works of over 20 acclaimed artists. Have a look at the intricately carved bone, ivory, and antler sculptures and knives of William and Elizabeth Lloyd at Lloyd Studios (303-378-0926; lloydstudios.com). Visit the Silver City Art Association (silvercitygalleries.com) website to find more galleries. Don’t miss the mid-July weekend-long Silver City Fiber Arts Festival (fiberartscollective.org) and the early-August Silver City CLAY Festival (clayfestival.com). Now in its fourth year, this prestigious event features workshops, juried exhibitions, and a market showcasing clay sculptures, mosaics, and mixed-media works. More than 50 murals adorn historic buildings throughout downtown as well as nearby Santa Clara and Bayard. Download a tour map from the Mimbres Region Arts Council site, mynm.us/mimbresarts.